If you are a regular visitor to this blog, you may remember reading that my 16-year-old cat Folster passed away last year, just before Thanksgiving. Although I miss him and think about him daily, I know he’s just on the other side of the veil, and that love transcends that barrier. For his sister Sofia, the adjustment has been much more difficult. She and Folster were together from the time they were in the womb. She too is slowly getting used to his absence, but still doesn’t like to be left alone and sometimes cries when I leave the house or take a long shower. One friend who has helped Sofia immensely is her stuffed animal, Birdie (pictured in the photo above). 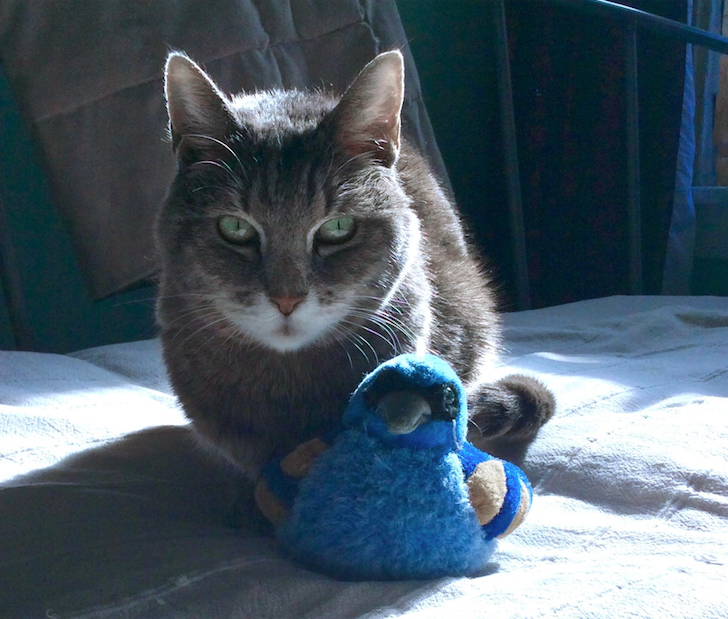 She’s had Birdie since she was a kitten, when I picked him out from a display of Audubon Society plush toys. Birdie represents the Blue Grosbeak. He originally chirped his authentic sound when his back was pressed, but time and repeated pressings have reduced his voice to a faint whistle. In fact, Sofia has enjoyed playing with him so much over the years, I had to sew up a hole she had made in his throat where the cotton stuffing was coming out. A freshly-repaired Birdie was her Christmas gift a few years back. Since the loss of her brother, Sofia has taken to carrying Birdie in her mouth, moving him from room to room, depending on where she wants to hang out. She wants Birdie there at bedtime too, sitting in the spot Folster used to sleep, and doesn’t settle down until she sees him there. 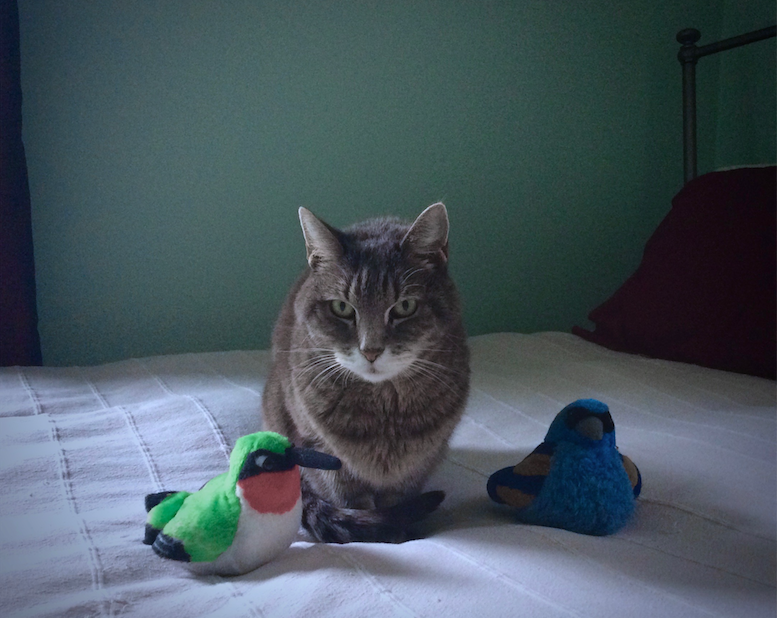 Birdie is by no means a replacement for Folster, but he is honoring Folster’s place, and that seems to comfort Sofia. I remember that, even though I was merely a spectator to the volleyball’s morph into best friend, as I watched the scene when Noland is finally attempting to escape the island on a makeshift raft and Wilson is lost at sea after a storm, I cried real tears; heartbroken, along with the movie character, by the loss. Wilson had also become real to me. The red and green bird in the photo below is Naso, Birdie’s friend. Sofia is fond of him, and especially likes rubbing her cheek against his long beak. Naso represents the Ruby-throated Hummingbird. Naso is a much newer toy, so his voice is still loud and clear and his colors are bright. He’s also much smaller than Birdie, and so should be easier for Sofia to carry in her mouth. In spite of Naso’s more manageable size and working voice box, he’s clearly not her favorite; Birdie is the only one she carries around with her. I can’t help but feel a bit sorry for Naso, having to settle for second lead. Birdie, and to a slightly lesser extent, Naso, have both become Sofia’s companions as she adjusts to life in the house without Folster, just as Wilson became the castaway’s companion as he coped with life alone, stranded on a island in the middle of the ocean. And, just as I found myself becoming attached to Wilson while watching Cast Away; as I watch Sofia make her stuffed animal friends into family members, and observe how their presence lifts her spirits and soothes her soul, I am feeling a soft spot growing in my heart for each of them. Birdie and Naso have become real for me as well. Easy to make Homemade Mascarpone Cheese tastes so good your taste buds will be in ecstasy for real. This was so easy to make and absolutely delicious – light years from the store-bought kind! You’ll need to start this a little over 24 hours before you want to serve (most of that time represents the mascarpone just chilling in the fridge). Use grass-fed cream if possible. Milk from grass-fed (pastured) cows contains an ideal ratio of essential fatty acids and is higher in beta-carotene, vitamin A and vitamin E.
Honestly, you could just eat this plain, with a spoon, it’s so good. However, if you want to take the slightly less decadent route, simply sweeten it with powdered sugar, maple syrup or honey to taste and flavor with a bit of vanilla, liqueur or cocoa powder. Then serve the flavored mascarpone to dip with fruit and/or cookies or spread on quick bread or pound cake for an easy and elegant dessert. I had it for breakfast this morning, spread on top of a slice of Trader Joe’s new Cinnamon Croissant Loaf. The combination was so delectable that if I were a Catholic I would have had to go to confession after eating it. You could also make Tiramisù in a Jar to tote to a friend or loved one’s house for you both to share, or as a gift for them to enjoy. I’ve included instructions at the end of this recipe. In a medium saucepan, heat heavy cream to a simmer. Add the lemon juice and whisk until the cream begins to thicken, about 10-12 minutes. Stir frequently and keep an eye on it, adjusting heat if necessary, to make sure mixture stays at a steady simmer and doesn’t boil and bottom of pan does not burn. When cream is thickened (if mixture evenly coats the back of a spoon when dipped, it’s ready), turn off heat and transfer the pan directly to a bowl with some ice and water (pan should be able to sit on top of ice and water without tipping over). Allow mixture to cool there in the pan for about 20-25 minutes. Meanwhile, line the sieve with several layers of cheesecloth or a clean tea towel. Place the lined sieve to rest on top of a slightly larger bowl and pour the cooled cream from the pan into the lined sieve (I removed the pan from the ice bath, emptied it, rinsed and dried the bowl and used this for my bottom bowl). Cover the cream with plastic wrap and place the whole operation in the refrigerator and let it drain for 24 hours. After 24 hours, remove the bowl and the sieve. The cream will have thickened further and you will see a few tablespoons of whey in the bowl that you placed below the strainer. Reserve this whey to use in other recipes, such as rice, smoothies, soups, sauces, etc. Squeeze the cheesecloth a bit to make sure no liquid is left. The thick, creamy stuff remaining in the cheesecloth is your freshly-made, authentic, mascarpone cheese. You will end up with about 1 cup (8 oz) of mascarpone. Use immediately in a recipe or cover and store in the fridge in an airtight container. Mascarpone is best eaten within a few days. Start by mixing mascarpone with a bit of espresso or liqueur to taste and just enough sugar to make it a little sweet. Put a layer of the sweetened cheese into the bottom of a pint-sized (16oz) mason jar with lid. 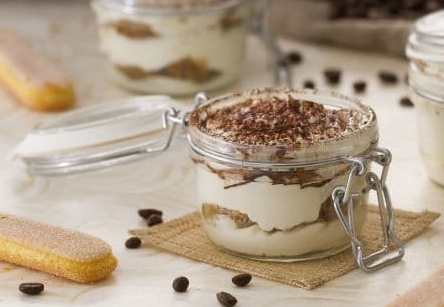 Dip crisp ladyfinger cookies in espresso and layer them in the jar, alternating with the mascarpone. Finish with a dusting of cocoa powder, chocolate shavings or a sprinkling of chocolate chips. Optional: add a single amareno cherry, raspberry or caramel on top. Seal jar and let chill in fridge for a few hours before delivering, enjoying or sharing. Beautiful, heartbreaking and heartwarming. Thank you for the reminder of the preciousness of life and relationships.